Using an MC filter for tone generation. Targeting individual instances of an MC-wrapped filter. One of the hallmarks of the MC system is the ability to have many instances of an object that are accessed as a single object. However, for interesting sonic manipulation, you may choose to make specific adjustments to each of the individual instances - and to do it with a ‘playable’ interface. 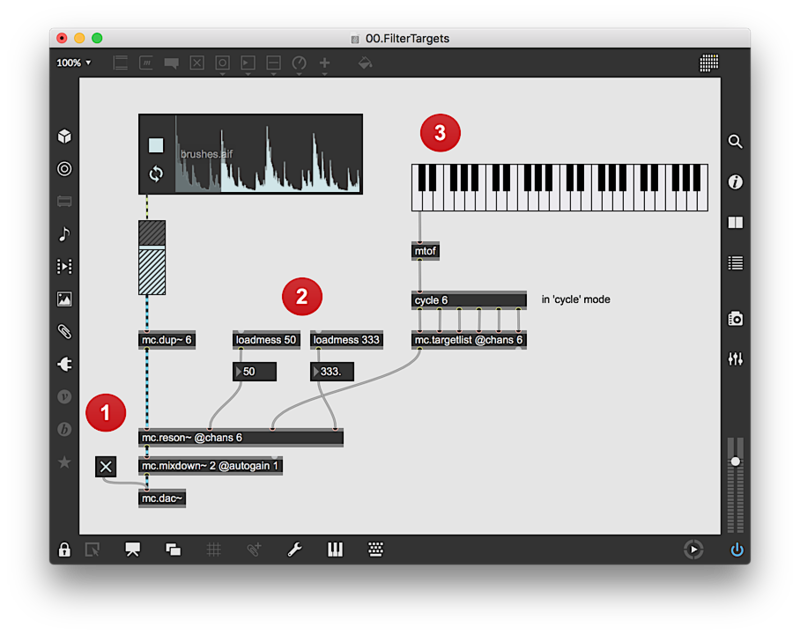 In this recipe, we use a virtual keyboard to control six channels of filtering to create a vocoder-like effect from ringing filters. The key sonic element of the patch is the six-channel resonant filter (mc.reson~). We use a standard playlist~ object as an audio player, but create a six-channel audio stream using mc.dup~. The audio playback stream runs through the filter, an mc.mixdown~ object and the output mc.dac~ object. The mc.reson~ object is preloaded with a high gain (50) and very high resonance (333.) setting, which will create a ringing filter sound. But no cutoff frequency is given, effectively shutting off the throughput of the sound. The keyboard is used to set cutoff frequencies of the filter. The output is changed to a frequency, then put through a cycle object, which takes received messages and rotates them through the available outlets. mc.targetlist~ transforms the incoming message into a message of the form setvalue n v, where n is the inlet number and v is the received value. This will set cutoff frequencies for the individual instances of the filter and allow us to set the generated ringing tone of each of the six filters. As a result, you can create an interesting rhythmic chordal tone from the noise-like output of the brushes.